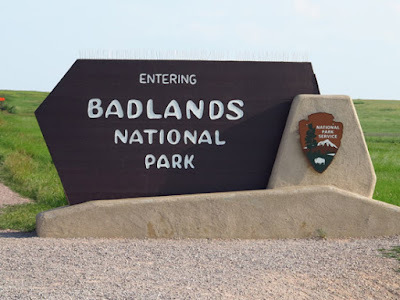 When visiting national parks, we like to watch films that are shown in visitor’s centers. These are usually beautifully done and provide history of the park in a concise and understandable way. 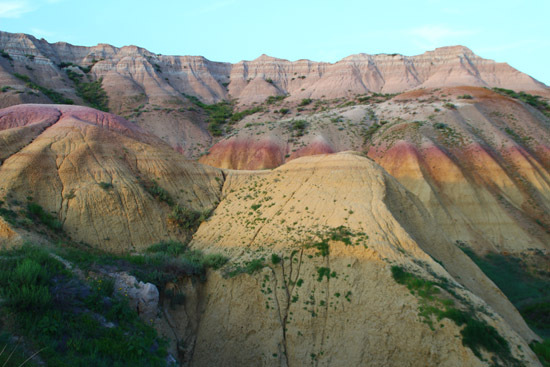 Rounded rock formations actually contain an interesting palate of color. From that film we learned that human history of the location goes back 12,000 years. 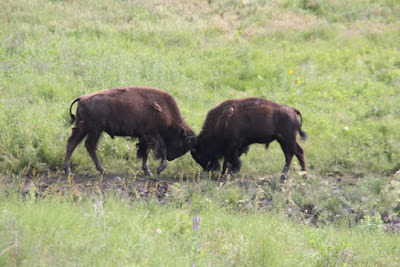 The Lakota Indians were nomadic tribes whose lives depended on buffalo for shelter, clothes (skin and fur), food and cooking—really everything. part in the ecosystem of the park. When the U.S. government made treaties with the Lakotas in the mid-1700s, they were forced to end their nomadic way of life and settle on reservations. White men then hunted buffalo nearly to extinction and put up fences. Resistance from the Lakotas ended with the battle and massacre of many Lakotas at Wounded Knee in 1870. Then came homesteaders in the early 20th century. Looking for a “good” life and free land , these people were called “sod busters.” They discovered that the land was not conducive to farming, and small scale farming was a hard way to make a living. Bitterly cold winters and fierce winds made for harsh conditions, and many left. 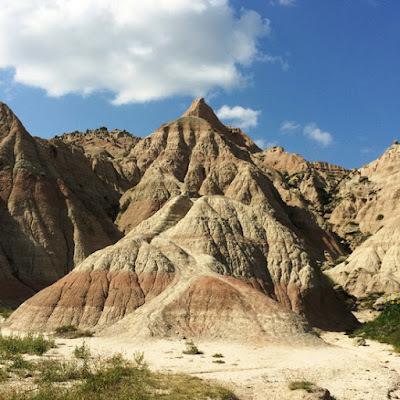 For a long while no one was interested in the area except geologists who studied the layers of rock. During the prehistoric period, ash from volcanic eruptions fell on the Badlands, and rain washed rock from the Rocky Mountains there. Layers developed: pierre shale (the lower level), brule (mid-level dark stripes), and sharps (top formations). Climatic change, river deposits, and volcanic eruptions—followed by erosion—created what we know as Badlands. 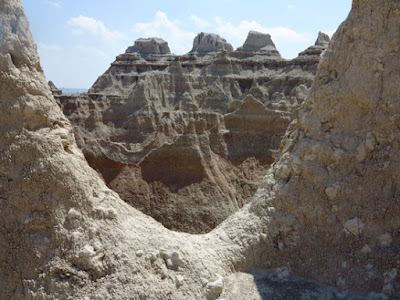 About 500,000 years ago wind, weather, and time began a period of erosion that has resulted in what we see today. Beautiful colors glow in late afternoon night. As part of a dynamic and changing earth, the rocks are eroding at the rate of one inch per year. 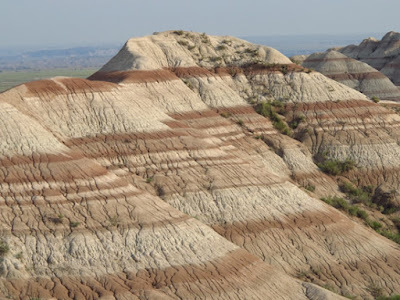 It’s possible that the stratified rock formations of the Badlands may be gone in another 500,000 years. In the meantime, plants and animals must adapt to a harsh environment with cold winters, hot summers, and wildly variable precipitation amounts. A formation called "the window." You can see why. In 1843 fossils from a prehistoric creature apparently related to dinosaurs were discovered in the layered landscape. These bones, from animals that no longer exist, encouraged creation of a new science---paleontology. That’s still a primary study in the park, and there’s a lab at the visitor center where people can watch scientists in action. 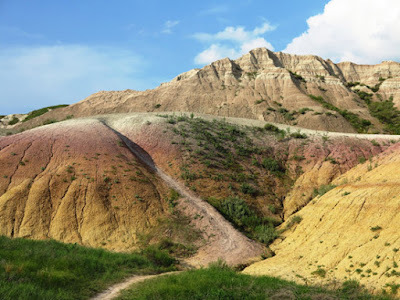 of Badlands National Park in South Dakota. 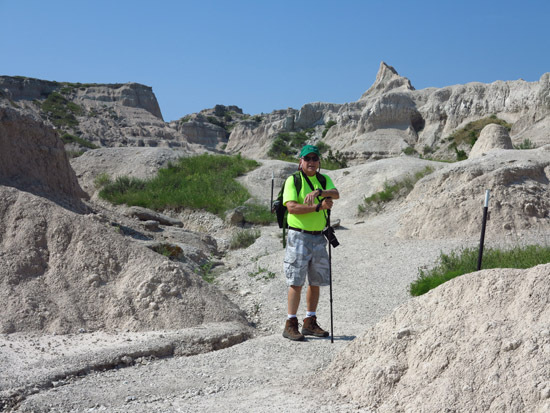 People who come to the Badlands today are generally curious about nature and want to see this extraordinary place for themselves. 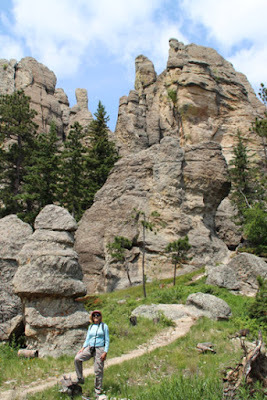 Besides, I know that any land that has been designated a U.S. national park is worth visiting. A national grassland covers the early landscapes of the park. Actually, the Badlands is not desolate or forbidding but supports a variety of plant and animal life. It’s a living, changing land, unexcelled in scenic splendor. Visitors (myself included) who stay awhile, observe the artistically sculpted geology, and perhaps hike some of the many trails for a closer look come to appreciate this “fragile touch of wilderness” that changes with the rhythm of the wind. 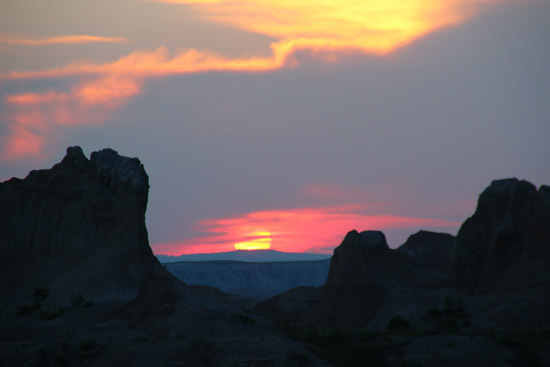 Sunset seen through the rock formations of the Badlands.